What skills are covered in this resource? How will this resource be beneficial to my students? 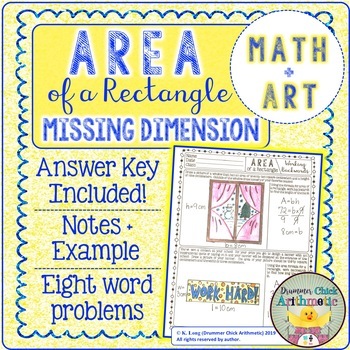 Your students will love finding the missing dimension of a rectangle because then they get to design a rectangle as described in each word problem!! 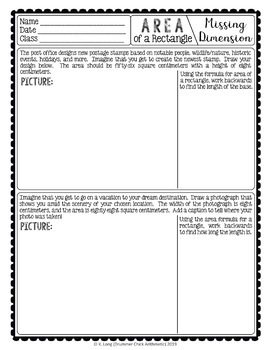 Your kids will design a postage stamp, cereal box, book cover, and more! They will also use a ruler to measure and construct each rectangle. 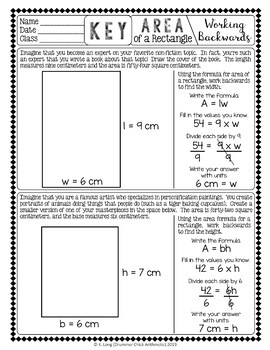 Staple the four student pages together as a booklet (cover is included) or do each page separately! 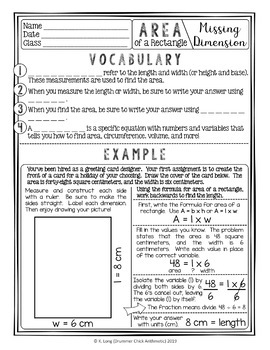 Suggestions for use are included on page 2 of the resource. Wait! You give away free and discounted resources? Yes, yes I do! Simply click the star near my name ("Follow Me") to be notified by email when new elementary- and middle-school products are related. Now products are 50% off for the first 48 hours!! I heard that I can earn TpT credits for leaving feedback. Is this true? Yes! You can return to your "My Purchases" page at any time to leave feedback on this resource. You'll earn valuable credits which can be used towards future TpT purchases! Thank you for visiting Drummer Chick Arithmetic!